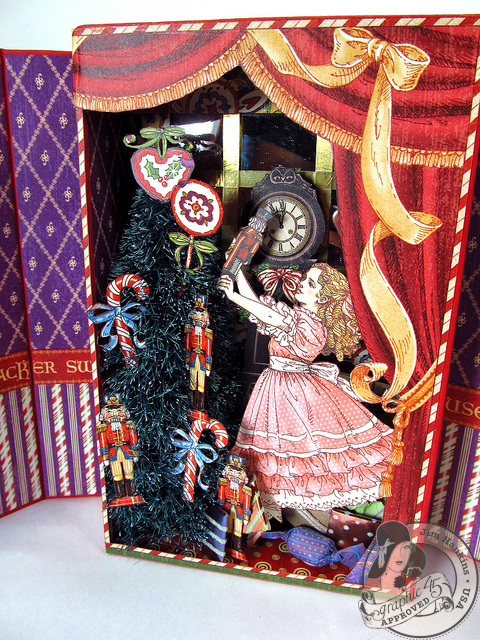 The Gentleman Crafter: Graphic 45 CHA Nutcracker Sweet Suite Unplugged! I did want to take a quick second and thank all of you who left so many, many awesome comments on my blog as well as YouTube about Mom. She now wants to be a movie star all the time. If the phone rings one more time and she says, "Did you read the comment that so and so left..." I'm going to unplug the phone from the wall! LOL!!!!! Not really! She's been so excited to see how many incredible people are out there and how sweet you all are. See Mom, I told ya! 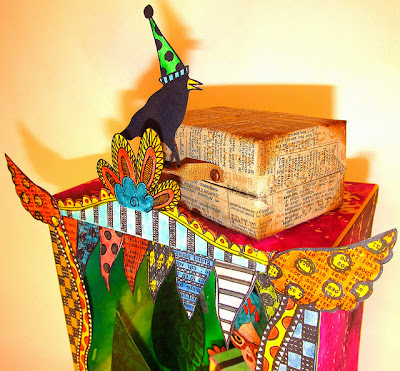 There is nothing better than the paper crafting community! Thanks Y'all! 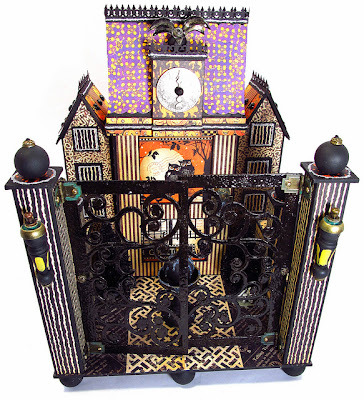 The roof on the Haunted House was actually the Nutcracker Sweet Suite roof. 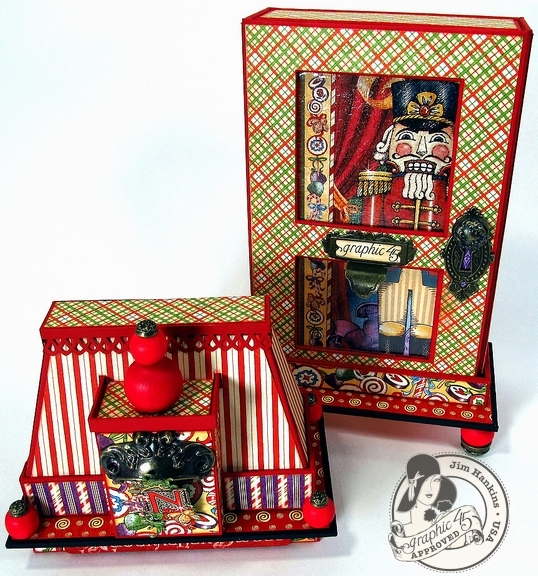 Behind all those circle roof tiles, you would see the G45 Nutcracker Sweet paper collection! Hahaha! For the Nutcracker Sweet Suite piece, I drew my inspiration from the same roof but I was going for a not so scary look. Something about the punched fence top that does that, I think. I made a new roof and actually punched the red top that you see and had it sitting on the roof ready to be adhered down. Then in passing through from one room to the next, I turned the punched rooftop section upside down to see what would happen. Ahhhh, to me, it didn't look so "haunted" anymore. Get me? LOL! You know me, I can go off for hours and have no idea what I wrote and later think, why on earth did I write stuff that you wouldn't be interested in in the first place! Hahahaha! Oh well! That's the roof story! I guess the point to that long tale was to say, by doing one thing you can draw inspiration to do another...I love that about crafting. You can't tell by the pictures, but I daubed Glossy Accents on the acetate, then used some plastic sheeting to pull the Glossy Accents up leaving a ripple effect on the acetate. Sorry you can't see it, it made it look like old glass window panes. The structure of the Suite was like I said above the Graphic 45 Altered box. I love these things as there are so many cool things you can do with them. The front of the box looked like a door to me, so I added the new metal keyhole and brad to the front making a doorknob. I made a base to hold the Altered box closed and once again the roof did this as well. I made the collar piece and placed a flat double layer of chip on that and added painted wooden balls and brads to the corners. I placed the new and my FAVORITE piece the Graphic 45 Antique Metal Door Pull on the gable and adhered the fussy cut "N" to it. Added a ball finial and the roof was done. I'm not a BIG fussy cutter, but I gave it a go and cut out all the little pieces inking the edges along the way. 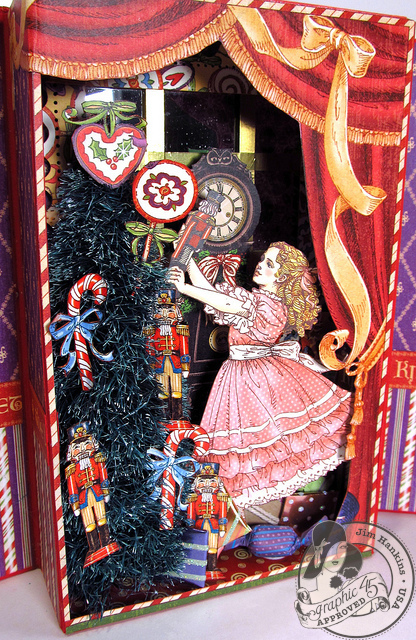 Clara, the curtain, what seemed like a million nutcrackers (hahahaha) the clock and some candy. I took a sisal tree and sheared it down to fit the box and then decorated it with the cutouts. Once again, sorry you can't see it, but I took a mirror and placed copper stained glass tape (don't know the real name of this lol!) on it. It really added so much to the inside. It gave the inside of the box dimension. It also gave one the feeling that it was a window or a mirror over a mantle. To finish up, I added Clara, some Jolee's candies and presents around her feet as she decorated the tree. Tomorrow, I will show you what I just finished right before I started blogging....My Dylusional Dylusions box! Want a sneak peek? OK you tease. Looks like another fabulous project. I think you are hooked on Dylusions!!!!! I loved your CHA projects Jim. You are just to ambitious. Who can keep on top of all your projects????? But I have to admit, I still love the lighthouse the best. I am so happy that Mom enjoyed the staring roll. I just loved her. What a sweetie. You look just like her and have that sweet disposition. Now who did you take after........hmmmmmm. Let me see. 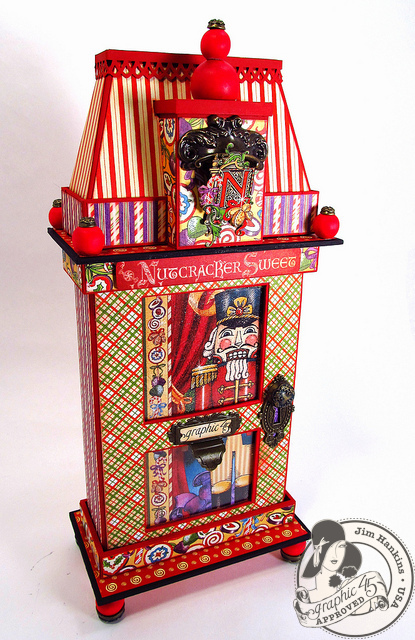 Love the Nutcracker Sweet tower and the Haunted Halloween House. Your constructions are amazing. Can't wait to see what's next. You never disappoint. thanks as always for sharing. Hi Jim, I love your Nutcracker Suite box. As usual the detail you put into your pieces is outstanding. I would not have guessed it was the same design from the haunted house. They look so different. Looking forward to seeing your Dylusions creation tomorrow. Glad your Mom loved reading all the comments. It was so wonderful to see you two crafting together. Hugs, Theresa. Ow Jim, you've done it again! What a brilliant project! 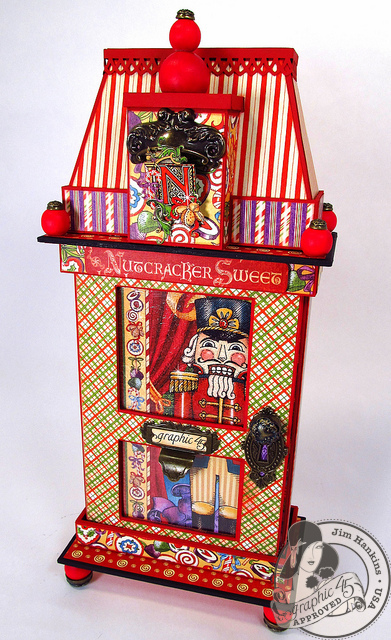 I can't wait till my store gets the Nutcracker Sweet papers!!! Brilliant work. Magnifique!! Merveilleux!! You've done it again, Jim!! 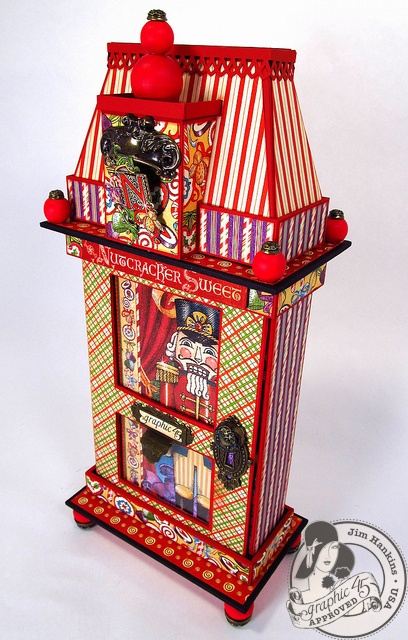 I loved the Haunted House when you unveiled it and the Nutcracker Sweet Suite is just as awe inspiring! Can't wait to see what's in store for us tomorrow! Hurry up will ya!! Beautiful project! I love everything about it. Great job! Thanks for the walk through on the nutcracker sweet suite. Fantastic detail. What a perfect holiday display piece. Ohhhhhhhh my, the Dylusions box looks fantastic! Have a great day! AGAIN...this is GORGEOUS!!! I was expecting to see a mini Jim decorating the tree. I know how you love Christmas but then once I saw the tree I knew that it could not be a real Jim tree because it was not loaded to the nth degree with decorations! 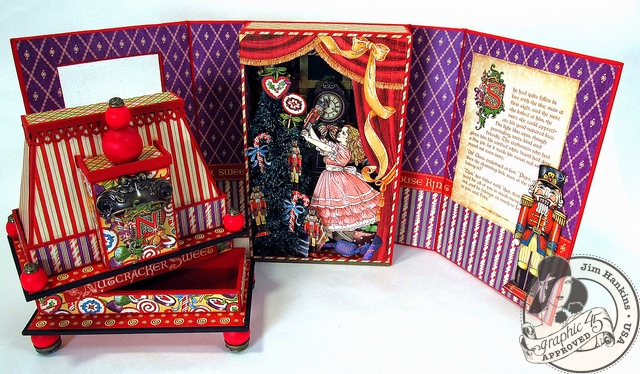 :') You did a great job on the "fussy cutting" If I can find this paper I just might be inspired to make one for my sister who absolutely loves Nutcrackers. Have a great day! love this Jim, I really like how you made the purple wallpaper on the inside - genius! Amazing! Beautiful work as usual. Looking forward to tomorrow's post. Oh my Jim! I love that Nutcracker box. I am enjoying going back and forth to all the details. Truly inspirational. The scene for Halloween is mind blowing. All I can say is WOW! That is simply amazing. Such detail! LOVE, LOVE the Nutcracker house!!! I really like all the detail...all the fussy cutting was worth the time and effort!!! The dimension in the Clara scene is spectacular!! Can't wait to see what Dylusional treat is coming from the little suitcase!!!! I LOVE this! Is there anyway we can get dimensions for the base and roof? Or a quick (if there is such a thing) how to video? I would love to make something similar but I have no idea where to start with the base and roof. Thank you for sharing this wonderful project! I LOVE IT!! You are so talented!! Wow Jim! I really enjoyed the halloween court yard, and it was fun to see that it was inspired from another project. You make the nutcracker sweet house sound so simple. All that fussy cutting gobbles up time. I am excited to see the fantasy tease you posted today. Impressive work as always. I enjoy seeing your attention to detail work. You are amazing as a crafter and we can all learn from you with your projects. Thanks for the tease that has me sitting on the edge of my seat waiting til tomorrow. OMG, can't wait for the Dylusional box. Looks like it is going to be one of my favorites. I have to tell you my fussy cut story. My friend is a Stampin Up demo and she needed me to help her make cards for swapping at convention. Being the wonderful friend that I am, I agreed without asking what I would be doing. She had chosen a frog stamp to cut out and pop up off her card. No big deal right? WRONG. Stupid frog had fingers and toes and I had to cut around each finger and each toe for 75 frogs!! I had dents in my fingers from my cutter bees for days! So now, when she asks if I can help, I find out if fingers and toes are involved! Love the Nutcracker. Can't believe it is getting to that time of year already. Only thing I would change is to put a real working clock inside! Still perfect the way it is too! This is an amazing project, Jim. I cannot wait to see the next one! Your momma must be so proud of your skills! You totally rock, Mr. Jim! The construction you do is amazing! You rock...you truly do! Fabulous creations! So amazing Jim as usual! Like your dylusions sneek- peek too ! Bravo!!! Jim, you are truly amazing! I have been admiring your work from afar (Massachusetts) for the past 3 weeks. I am in total awe of your creativity and know-how! Please keep posting - I check everyday!!! Ditto...ditto...don't want to be redundant, but perhaps you never tire of hearing the accolades (and you mightily deserve them). I love to see your work and every time it makes me want to run to my craft table, put everything on hold, tell people to leave me alone, and just craft. In a perfect world...I can dream anyway. I"m thinking about mixing the haunted house idea and the Christmas house idea. White fence...glittery trees and snow...not sure how it will work, but I am thinking about it nonetheless. BTW, like everyone else, I hate the teasing (wet my appetite but refuse to show me the whole project), but it is a good thing not to overload us with too many fantastic projects at once otherwise we may explode from sheer excitement. Jim, I'm not a big fan of Halloween (can you IMAGINE!!!) but your project is great! And the Nutcracker Sweet Suite? Words fail!! Jim, of course I love this project -- but I cannot find those boxes in stock anywhere! Could you do another shout out for that friend of yours who has a scrapbook store? Is she in Texas (she sent you the We R Memory Keepers small 8 punches)? Does she ship? I have my name on several waiting lists.... If I can't find them, I'm going to use my newly acquired constructions skills (thanks to you) and make something like this from scratch! I am so thrilled to have discovered you and your blog and your youtube channel and your work! Well, I'm in love! What a goergeous project! And please tell Graphic45 that we NEED those boxes in the stores! So hard to find! Okay I see, you're an architect. Your just showing off aren't ya, putting all of us girls to shame. I just love the three dimensional pieces you make, I'm in awe of the two pieces I've seen so far. I literally just found you and the first two postings have blown my socks off (and I don't even wear socks, how'd that happen?). I was kidding btw up above, just my sense of humor. You're amazing!! Thank you for sharing your work with us and for the inspiration I am leaving with. Your Nutcracker Suite house is wonderful! I love your attention to detail like the effect with the acetate "glass". Jim Love Love Love the Nutcracker Suite You are just amazing. I'm in just aw with all of your fantastic projects you share thank you again for sharing. you have heard this a hundred of times I'm sure you are such an inspiration with all your fantastic idea's. You are so blessed that you look outside the box. That is one of the reason I just look forward to seeing each project you have done. Thank you again.